This right angle weave video tutorial is for those of you who are having a tough time with right angle weave (RAW). It’s also a quick overview of the stitch, if it’s been awhile since you’ve done it. This video tutorial is also for anyone who wants to see what RAW can do, because I show some jewelry I made with right angle weave that I think looks pretty neat. 🙂 And the pieces show the versatility of the stitch. Here’s the video, along with some more tips and info on the jewelry just below the video. OK, so now you’ve seen the video, and you’re wondering about 1) any tips fro RAW and 2) the ebook tutorial. I’ll start in reverse order; click here for the link to the right angle weave ebook tutorial. Next, here are some tips for working right angle weave. It’s really not a difficult stitch once that “ah-hah!” moment hits, but it is one of the more difficult beadweaving stitches for most people. Start with size 8 seed beads that are not super-shiny; the reflection off the surface can make it tough to see which bead you’re working. Matte beads are even better. If you have some beeswax or micro-crystalline wax, put some on your thread; the stickiness will help hold your beads in place, especially since you are working with larger-holed beads. Pick beads that have an even shape, but not Delicas (which aren’t the best for learning RAW). Toho seed beads are excellent to learn on. If you’re having problems with size 8 seed beads, try round 3mm or 4mm beads. Glass pearls or Czech druk beads are good, as they are large enough to see easily, but they have a smaller hole than the size 8s, so they stay in place a little better. Keep your tension as even as possible — snug but not tight is best. If you’re having trouble telling which beads are top and bottom, and which are the sides, alternate your colors. In other words, instead of stringing on four turquoise beads, start with 1 turquoise, 1 white, 1 turquoise, 1 white. Then keep alternating the colors, and it will be easier to tell the tops and bottoms from the sides. Don’t get discouraged! When I was learning, the straight line part was relatively easy, but the step up drove me crazy. Finally one day I decided to sit at the table and not quit until I had mastered the step up. I was there at the table like 2 hours. Of course back then all that was available was written directions; I probably would have gotten it sooner if I had a video to watch. So I hope this helps you to learn right angle weave. It’s definitely worth adding to your beadweaving patterns because it really is versatile — not to mention fun! You may have already seen my right angle weave video tutorial on my “sister site”, but now it’s time for another look at right angle weave. Because it doesn’t always look the same! When you think of RAW (as it is also called) you probably think of a piece that looks like a grid of sorts. And you’re right — it does often look that way. It is usually a very regular beading stitch. But what happens when you choose a different kind of bead to make your piece? What happens is what I call “Slink Stones”! And if you want to make your own, read on and you’ll get a video tutorial! This isn’t a typical look, and isn’t immediately obvious that it’s right angle weave. But once you see how it’s made, it’s definitely RAW. The feeling of this particular piece is very, very slinky on the wrist — thus the name. I made this bracelet with one of the toughest beads to use easily — gemstone bead chips. Sure, they are easy to use as a component, in (for example) a strung necklace. But it’s not all that often you’ll find a project that uses the chips as the main bead. Before you get to the video, though, I do want to mention something — this bracelet is pretty heavy due to all the gemstone chips used. You will definitely want to use doubled thread and/or something like Fireline. Gemstone chips, roughly a 16″ strand. You won’t use all 16″, but unless you have a 6 inch wrist, you’ll use more than half. 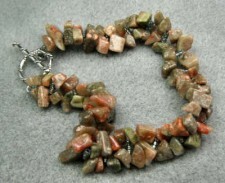 In the video, I use a jasper — usually I hear it called either “autumn jasper” or “harvest jasper”. Seed beads — size 11, somewhere around 2 grams, give or take a little. Clasp. I use a sterling silver toggle clasp. A two-strand bar clasp would also work nicely or a lobster claw would be good. Thread — use something like Fireline or PowerPro. Use at least a 6-lb test — 8-lb is even better. This is a heavy bracelet! Although I don’t show it as doubled in the video, you might want to consider it. Don’t bother with something like Nymo — it will end up stretching and sagging. Needle — size 10 will work, or you can use a size 12 if you wish. You can use a sharp or the longer beading needle, whichever you prefer. Scissors or other cutter. I know a lot of people say don’t cut Fireline with your good scissors, but I’ve been doing it for at least two years now. Just don’t cut it with the tips.